Take a moment from your busy Sunday to take in the work of our church community artists. We feature a new artist each month. Pysanky are Ukrainian Easter eggs decorated with symbolic designs using a wax-resist process and colorful dyes. This is an ancient tradition dating back more than 3,000 years. The eggs symbolize rebirth and new life. Because of its long history, the shapes and geometric patterns in the designs have both pagan and Christian symbology. For example, a triangle represents air-fire-water, and can also represent the Holy Trinity. Real egg shells are used. Traditionally the eggs are not emptied, however Maggie empties the eggs before she writes on them. Chicken eggs are most readily available; however, any type of egg can be decorated, including goose, duck, turkey, and ostrich eggs. The designs are written on the egg shell with a tool called a kistka. This tool is held similar to a pencil and is used to free-hand write liquid beeswax on the egg shell. The wax seals that area from dye keeping it white, meaning it is a wax-resist process. The egg is then dyed, and more wax is applied. The process continues with a color progression until the pattern is complete. The final step is to remove the wax, revealing the colorful pattern. Depending on the level of detail in the pattern, it can take 3—4 hours to finish a chicken egg. Lent is the traditional time for writing pysanky, with a more intense effort during Holy Week. 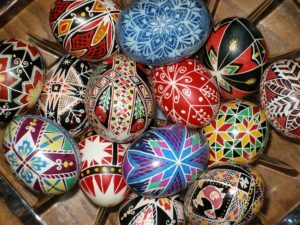 The Ukrainian tradition is to place the pysanky in a basket on Easter morning and bring them to Easter service for a blessing. Although it has roots as an Easter craft, hobbyists create the eggs year round. Maggie picked up this hobby as a distraction and creative outlet in the late 1990’s while studying engineering. Her inspiration comes from the traditional symbols and designs, but can also be found in nature such as animals or flowers and in everyday items such as patterns on tiles, rugs, or pottery. Maggie finds the geometric shapes and symmetrical designs beautiful. Although she’s not Ukrainian, roots of a similar type of egg decorating can be found in her Polish heritage. Maggie will lead Adult Education on Sunday, April 14th from 11:20 a.m.—12:00 p.m. in the RCPPC Chapel. Come learn more about the history, tools, techniques, and symbology of Pysanky.